I made the disagreeable trip up to Atlanta recently during a time still very much effected by the collapse of I-85 North. Along the way, I listened to the podcast "The Sporkful" wherein a story was related on the subject of Rosa Parks and a pancake recipe discovered among her personal things after her death. The story told in the podcast isn't all that interesting (you can read a brief account of the recipe and it's background at Serious Eats). It is, in reality, simply a recipe written on the back of a bank envelope and titled "Featherlite Pancakes." What is interesting and has captured the attention of many is that in the recipe, which is otherwise unremarkable, Rosa calls for the unorthodox inclusion of peanut butter in the pancake batter itself. What frustrated me was how, after going on and on about tangentially related facts regarding Rosa Parks, peanuts, and Civil Rights, the Sporkful show failed to actually make the recipe. Rather, the person they had cook the pancakes from the basically re-interpreted the text through a modern cookery lens, added her own revisions, and thus cooked a knock-off. She used buttermilk, for example. Now, I adhere to the Food Lab theory of pancakery that does indeed use buttermilk, as well as sour cream and a mix of baking powder and baking soda. The buttermilk does lend some tang, but it is more there to react with the baking soda which is itself there to ensure good browning. Adding buttermilk to the Parks recipe is pointless. There are many good ways to make pancakes. The question at hand being, is the Parks recipe one of them? I had to find out. I grew up eating peanut butter on my pancakes. In fact, my favorite combination at my Grandmother's (where homemade pancakes and waffles were a staple) was crunchy peanut butter smeared on top then doused in faux maple syrup, what is now called "pancake syrup." As I matured, I switched to honey instead, because peanut butter and honey is a perfect combination and that's a fact. To add peanut butter to the batter didn't seem like a great idea but I was willing to give it a try. The first question I had was, what would peanut butter have looked like at the time of the recipe's writing? I wagered that it would not have been a jar of JIF or the like that is heavily sugared and filled with preservatives. I figured that what we would consider "natural" peanut butter is closer to what would have gone into the recipe, which already includes a good bit of sugar. The only other considerations are the the cooking method and the "shortening or oil" mentioned at the end of the recipe. Shortening at that time was almost certainly Crisco (which comes from "crystallized cottonseed oil" FYI) and as we all know, hydrogenated vegetable oils are apparently the devil. So I decided to just do what I usually do and wipe the cooking service with canola oil and a paper towel. As for cooking method, the recipe specifies a temperature, which is odd. If you are using a skillet or griddle on a stove, you think about heat in terms of low, medium, and high flame. Without a fancy laser thermometer thing, I don't know how you would gauge the exact temperature of your cooking service. Unless of course it was electric and had a built in thermostat. I happen to have such a griddle. Did Rosa Parks? It is historically possible, as "electric frying pans" were all the rage in the late 50's and 60's. With all things considered, I made the pancakes according to the recipe. Two tablespoons of baking powder is a LOT of baking powder. I had to heat the peanut butter slightly to get it to run, but not so hot as to curdle the egg. The nut butter makes the batter a pleasent beige color. True to their name, the pancakes were light and airy. The peanut butter made them smell amazing while they were cooking, and that alone is reason to give the recipe a try. They say that you do most of your tasting in your nose anyway. I ate these bad boys plain at first to give them a thorough examination, and I can safely say that the only real negative was that you can taste the baking powder after a few bites. The peanut butter mostly covers it up, and I'm sure with some syrup it would be basically undetectable. Also, having the peanut butter mixed into the batter made the whole process messier than usual, but I would honestly say it is worth it. Rosa Parks was on to something with this recipe, and with a few slight adjustsments, I'll be more than happy to make them again. Really any excuse to add peanut butter to something is valid. My trip up to Atlanta resulted in another breakfast exploration based on the internet. Said exploration was due to an article in Bon Appetite that a friend had read entitled "The Best Biscuits in Georgia are at the Gas Station." The article focused on one woman in the Monroe area at a Chevron, and since we were heading to Snellville anyway, we decided to go a few minutes out of the way to try these lauded pastries. We of course arrived to find the entire gas station closed down for good. The article did mention that the woman would be moving to another gas station in June, but failed to explain why. Undeterred, we drove back in the direction of Snellville and found Sho'Nuff Biscuits, BBQ & More at a Chevron a few miles down. We had biscuits on the brain now, and no other breakfast treat could cure that malady. Sho'Nuff took up a good third of the Chevron, which was more substantial than many of the biscuit or fried chicken services I'd seen in other gas stations throughout the South. The biscuits were big and flat, and good enough by any measure. 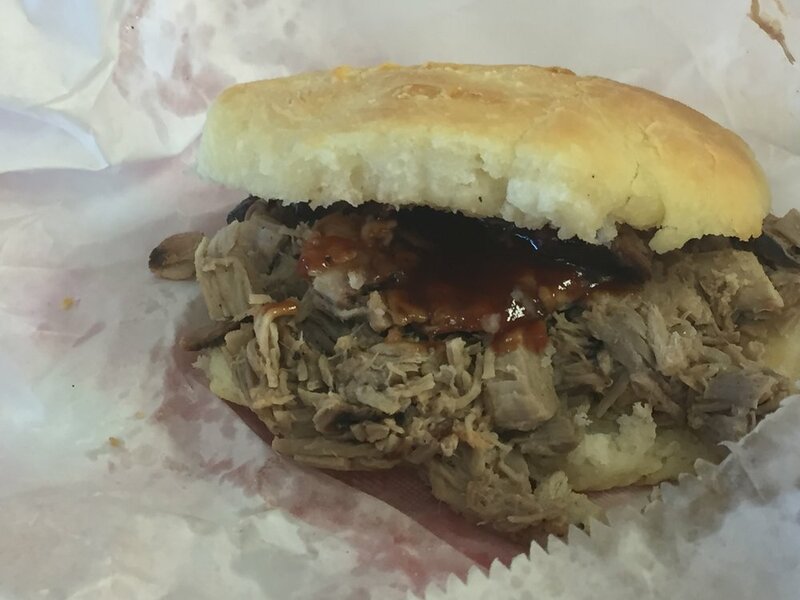 However, the true stand out was a combination that I had, somehow, never before encountered anywhere: the BBQ biscuit. It seems like such a logical, Southern combination, but when I think about it the problem seems to be that most BBQ places are not open before lunch time. This is no doubt due to the time needed to get the meats properly smoked and prepared. But what if you had some pork butts ready to go after an overnight smoke? Or even just some leftovers that have been reheated? I'm not sure what the case was at Sho'Nuff, but it really didn't matter because I would have been happy either way. Other biscuits were sampled, and are pictured below to include a pork tenderloin (basically a bone-less pork chop biscuit), a chicken biscuit (didn't hold a candle to Chik-Fil-A), and a hot links and egg biscuit. All were good in their own way, but not necessarily worth making a trip for...unless you want that BBQ biscuit.